T/T method, 30% advance payment, the other 70% money will be paid off after checking and accepting of devices. Or you can use irrepealable letter of credit to pay and your confirming bank must be a European or an American bank with a good reputation. We offer installing and debugging services of our devices and staff training for factories abroad. And customers should pay for fee of visas, round-trip tickets, accommodations, and allowances of 50 dollars every day for technicist of our company. During the period of installing and debugging, please offer an interpreter, so that the communication and staff training will be easy and convenient. Additionally, when delivering the goods, we will offer the easy-wear spare parts for 1 year. We offer OEM service at the same time. With the rapid development of world economy and fast circulating of mass information, today equipment manufacturers are flooding on our living earth and that has also taken customer into the trouble about how can successfully purchase satisfactory machines. However, we believe that only high quality facilities can give satisfying and unforgettable experience to customers and that only in that way we can create due value for our customers. As the manufacturer of bottled beverage filling machines, we want to tell some questions that need customers' attention when they are purchasing filling devices. The beverage processing equipment industry is required to adopt sanitary stainless steel to manufacture the relevant equipments. However, today many equipment manufacturers employ many kinds of alternates to manufacture in order to reduce their costs. Maybe, you never pay much attention to some slight places, but they may bring great trouble to you one day. For example, some manufactures use carbon steel to manufacture the upright column on the platform and the wear stainless steel outside this column in order to save their costs. So it is quite difficult for you to find that, but later, you may find a platform full of rust stains. That is because water permeates inner part of the column and then the surface of the platform to make it get rusty. In that case, it not only reduces the sanitation degree of the equipment, but also influences the stability of the device. 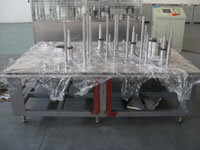 But our upright column is make of fully stainless steel and is fasten on the platform cooperated with sealing ring. Consequently, you never have to worry about pollution issues. The device adopts a lot of bearings and wheel gears, both of whom are needed to add some oil lubrication. However, many devices of some manufactures have no obvious mark of lubrication holes, which causes customers easily to forget some lubrication holes. Without well lubricating, the working life of equipment is difficult to be ensured. But, we put together all the oil lubrication paths to make it easier and more convenient for customers to lubricate and maintain their devices. Of course, there are still many other differences between our machines and those of other manufactures to wait for you to find. For more guides, please contact us. However, with the professional manufacturing experience and excellent products, we believe that we are a reliable supplier that can satisfy you needs. 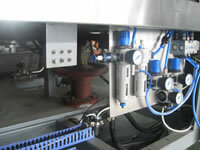 So, if you need soft drink production line, please contact us.